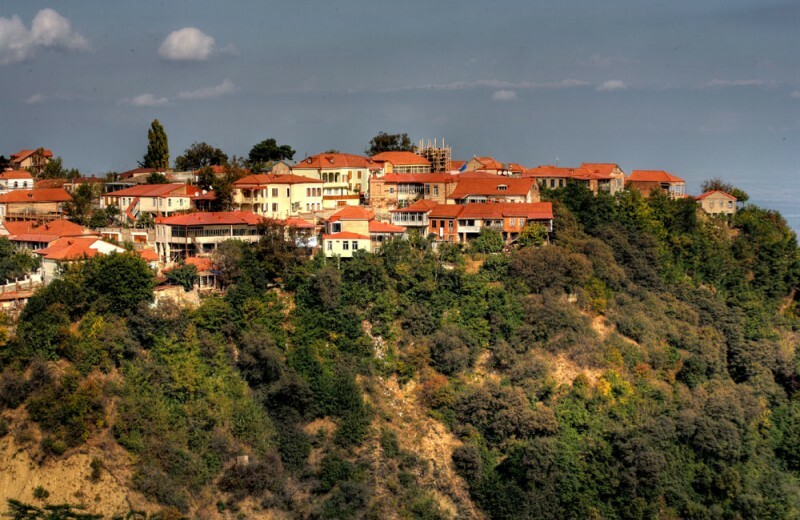 Sighnaghi (Signagi) (Georgian: სიღნაღი) is nestled atop a vine-covered hillside in the heart of Georgia’s wine country. The territory surrounding the modern-day town has been settled since the Paleolithic period and was known as Hereti in the Middle Ages, and as Kiziqi after the 15th century. The town has an area of 2.978 km² with 24.3% being residential. It is a walled city of hidden treasure known for its charm, beauty and romance. Sighnaghi is one of the country's smallest towns (population of 2,146 as of the 2002 census) and its economy is dominated by production of wine and traditional carpets. The town and its environs are also known for their landscapes and historical monuments. Sighnaghi has recently undergone a fundamental reconstruction program and has become an important centre of Georgia's tourist industry.Steeped in history, and now meticulously restored to its former glory, Sighnaghi offers the elegance of the 18th century, as well as the comfort and luxury one would expect from any first class holiday destination. This lovely hilltop town is famous for its stunning landscapes, winding streets, hilltop gardens and beautiful skyline.